Livia Altmann ’20 (pictured above), from Arosa, Switzerland, helped the Swiss women’s national ice hockey team qualify for the 2018 Winter Olympics in Pyeong Chang, South Korea. Altmann won the bronze medal at the 2014 Sochi Olympics as part of Team Switzerland, with whom she’s been a captain for the past two seasons. At the Olympic Qualifying Tournament this past February, the team had a perfect 3-0 record, beating out Denmark, Norway, and the Czech Republic. The athletics department and counseling center are collaborating on the “It’s On Us” campaign to help keep women and men safe from sexual assault. The campaign asks the community to pledge not to be bystanders to sexual assault, but to be part of the solution. A video — featuring student-athletes, administrators, and counseling center staff members — debuted at the men’s hockey game against Dartmouth in January. Colgate unveiled a brand-new hardwood practice court to the benefit of the Raider basketball and volleyball teams. “Ever cognizant of our academics-first commitment, this new space provides greater flexibility for our student-athletes to practice during hours that enable us to minimize scheduling conflicts,” said Vicky Chun ’91, MA’94, vice president and director of athletics. The court represents the first phase in the process of repurposing Starr Rink — the former home of men’s and women’s ice hockey — since Riggs Rink opened in October. It is a Connor Sports QuickLock portable floor, the same brand that is used for the NCAA basketball tournament as well as by several NBA teams. The men’s Raiders spent an afternoon in Central Park volunteering with Ice Hockey in Harlem. 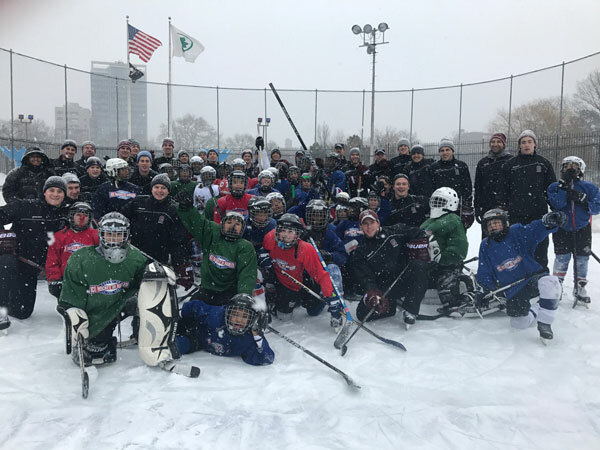 On a weekend off from competition in January, the men’s hockey team still hit the ice when they volunteered in New York City’s Central Park with the organization Ice Hockey in Harlem. “It was a perfect backdrop — an outdoor rink with snow falling — with Division I college student-athletes and young players speaking the same language: hockey!” said head coach Don Vaughan. Colgate’s players and coaches spent two hours with the children, teaching hockey fundamentals and having a blast on Central Park’s outdoor rink. Goaltender Charlie Finn ’17, from North Vancouver, British Columbia, made 26 saves January 27 against Dartmouth and set an all-time program record, bringing his career total to 3,072 saves. With just over seven minutes left in the game, Finn made an incredible blocker save in front of a wide-open net on a shot from a Dartmouth player, preserving Colgate’s 2–1 lead. Later, with just 10 seconds left, Finn made his 26th and final save to break the previous Colgate record — 3,071 saves by Mark Dekanich ’08 — that had stood for the past nine seasons. 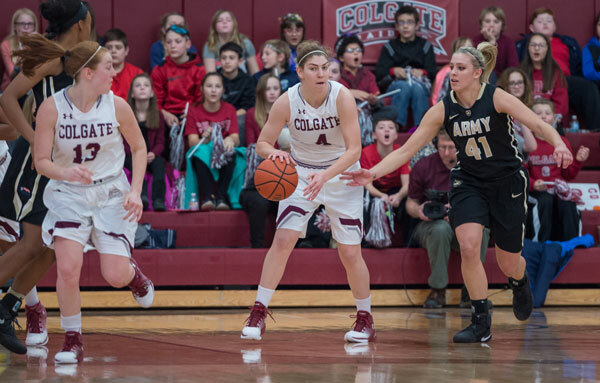 Cotterell Court was nearly filled to the rafters for the Second Annual Kids’ Game for Colgate Women’s Basketball in January. The Raiders hosted Army West Point’s Black Knights, which won 76–69. Children came from seven local schools: Path Finder Village, Hamilton Elementary, Harts Hill Elementary, Madison Central Elementary, Morrisville-Eaton, Otselic Valley Central, and Sherburne Elementary. Sponsors Gilligan’s and Oliveri’s provided 2,000 cups of ice cream and 180 pizzas, respectively. In addition to free treats, the kids received pompoms and coupons for a future Colgate basketball game. To honor Camden Cross, a teenager who overcame leukemia as a toddler, the men’s ice hockey team welcomed her and her family to one of their practices in January. 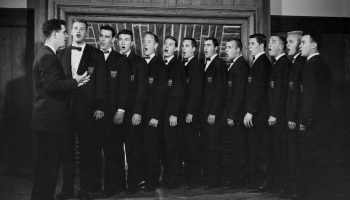 The Crosses watched the Raiders practice before having pizza and getting to talk to the team in the Tighe Sullivan Suite at the Class of 1965 Arena. The Raiders presented Camden with a jersey with her last name on the back. A week later, she was honored at the Courage Classic Game between Colgate and Cornell in Ithaca along with other children from Camp Good Days. Based in Mendon, N.Y., the camp is the largest organization of its kind, working to improve quality of life for children with cancer and their families. After a stellar campaign, men’s basketball forward Will Rayman ’20 has been named the Patriot League Rookie of the Year, in addition to earning a spot on the All-Rookie Team. He wrapped up the regular season averaging a team-best 14.4 points per game in addition to 4.5 rebounds per contest and a 44.3 field goal percentage. The New York City native contributed an average 14.9 points per Patriot League contest, which was the eighth-best record in the league and first among league first-year students. He tallied 22 double-digit scoring efforts, including six 20-plus–point performances, and led Colgate in scoring in 10 games this season. 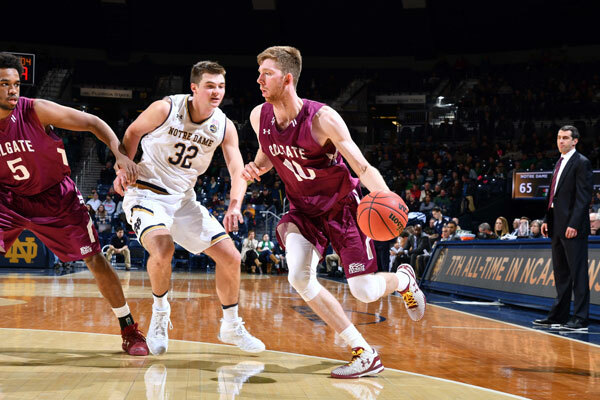 Rayman becomes Colgate’s fourth-ever basketball Patriot League Rookie of the Year and first since 2001. He joins the elite company of former standouts Adonal Foyle ’95, Pat Campolieta ’99, and Mark Linebaugh ’01. Rayman is the 15th Raider to earn a spot on the All-Rookie squad. 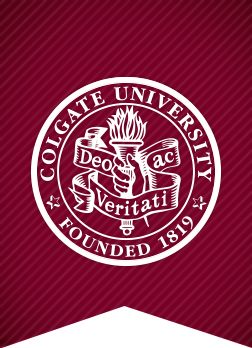 April Cornell, a central New York native, is the new head coach of Colgate’s field hockey team, the fifth in its history. A 13-year coaching veteran, Cornell arrived at Tyler’s Field after spending 11 seasons at Hofstra University. Throughout Cornell’s tenure at Hofstra, the Pride boasted a 26–13 overall record during the 2014 and 2015 seasons. She helped 19 student-athletes to receive All-Region honors and 30 to the All-Colonial Athletic Association. A native of Afton, an hour south of Hamilton, Cornell earned her psychology degree in 2005 from the University of Connecticut, where she was a four-year letter winner and led the defensive unit to a No. 1 national ranking as captain her senior year. Connecticut made four NCAA and four Big East tournament appearances. The Huskies also captured three Big East regular-season titles and two conference tournament crowns during her time in Storrs. 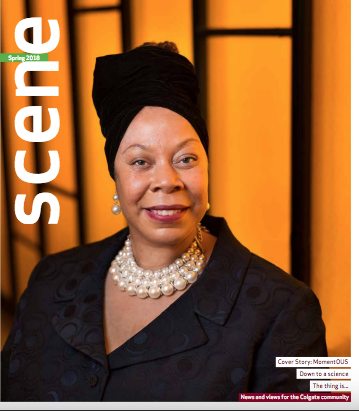 Cornell continued her studies at Hofstra, earning a master’s degree in business administration in 2013. Football defensive end Pat Afriyie ’18 has been a popular pick on the postseason All-America awards circuit. Named to four different All-America teams, he is a recent addition as a second-team member of the STATS FCS (Football Championship Subdivision) squad. Afriyie also was a second-team pick by the American Football Coaches Association and a third-team selection by the Associated Press. College Sports Madness kicked off the postseason awards bonanza by naming Afriyie to its third team in December. The Sandy Hook, Conn., native earned ECAC Division I FCS and Patriot League Defensive Player of the Year honors after posting 10 sacks for minus-83 yards and 21 tackles-for-loss for minus-108 yards. Afriyie led the Patriot League and finished fourth nationally in both of those categories. He was an ECAC All-Star and All-Patriot League First Team selection for the second year in a row.